I’m in awe of the lovely gift Kate McKinnie gave her mother last Christmas. This gift isn’t limited to Christmas or Moms, and I am so happy to share her idea with you today. Last Christmas, I had a hard time coming up with a special gift to give my mother. We have a very close relationship, and she is my favorite person on my Christmas list to shop for each year. Ever since I went off to college more than 20 years ago, we haven’t lived in the same place, so our weekly phone chats and our seasonal visits are what keeps us close. I got married in 2013, and my visits home have decreased so I could spend equal time with my husband’s family. Rather than a new sweater or some jewelry, I wanted a gift where we could really connect and spend more time together. So, I created “The Mother/Daughter Book Club” and wrapped up a certificate for her to open on Christmas Day. In a year’s time, we certainly covered a wide spectrum of book genres….self-help, memoirs, historical, nutritional, religious, a murder mystery and some other good fiction! This book club was so much fun, and I enjoyed going to 12 new places with each book we read. For the most part, we enjoyed (and didn’t enjoy) the same books, so being in agreement on each book made this year-long gift even better. Another neat part was hearing her insights on the books during our debriefing phone calls. She would have new and different impressions of the plot and characters, which enhanced the book all the more for me when I saw it through her eyes. 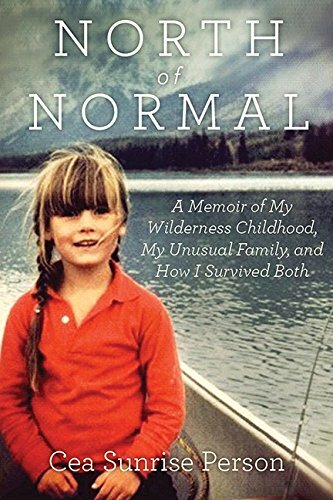 North of Normal – a page-turning account of a highly dysfunctional family and how hippie author Cea Sunrise Person was exposed to highly mature activities at a young age and the impact that had on her future relationships. The Day I Met Jesus – a must-read for any Christian woman! It offers a fictional account of 5 important women in the Bible and the day they meet the Lord. I will never view these Biblical stories the same after reading this powerful and emotional book! Little Black Sheep – I enjoyed Grammy award winner Ashley Cleveland’s memoir from start to finish! I work in the field of addiction/ recovery support and never before had I read such an honest personal testimony of what it’s like to struggle with alcoholism. Who knew memoirs would be a new-found favorite for me, since two of them appear in my top three best reads of 2015! It should also be noted that this “top 3” could change after I finish the December book. Wow…I am enjoying The Art of Racing in the Rain more than I thought I would, since it’s told from a dog’s point of view! I highly recommend this gift idea for anyone looking for a unique and fun way to connect with a loved one. Mom and I are keeping it going for 2016, too! I’m giving the “BFF Book Club” to my best friend Sandra, and my mom is re-gifting this idea with two of her girlfriends this Christmas. Kate Tanis McKinnie grew up in Roanoke, VA. She attended Appalachian State University for college and received a master’s degree from the University of Georgia. She moved to Nashville in 1999 and has had a successful career in the nonprofit community. Her current role is in Development at The Next Door, an 82-bed facility providing treatment and re-entry support for women with addiction, mental health disorders and/or coming out of incarceration. Kate is married to Ryan, lives in Mount Juliet, and has two step-children, Savannah and Ryland. Her mom Debbie lives in Roanoke, VA. This is such a lovely idea, thanks for sharing! A great idea and a great list of books! Thank you! Miss Kate sounds like an angel among us. Thank you for sharing her and her lovely idea with us all. Kate is a friend of mine, so I know she comes up with some of the most creative and useful ideas, and this is one of her best. I know what my daughters will be getting in their Christmas stockings! Thank you, Kate! What wonderful idea! Love this. I love this idea and I love Kate! Thank you for sharing this great idea! Kate, you continue to amaze me with your creativity! !